SO HOW WAS IT PUT TOGETHER? 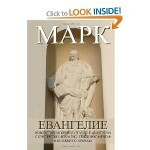 The Revised Version of the 1940 Bulgarian Bible, which our ministry has been working on since 2005 and released earlier in 2012, was presented at various book markets, festivals and churches for the Bulgarian Easter on May 5th. The 1940 revision was initiated in 1920-24 by the British and Foreign Bible Society, reprinted multiple times and smuggled in Bulgaria under communism. 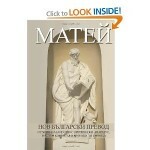 It is perhaps the most read Bulgarian Bible of all times. While a number of new versions have attempted to replace it, this revision made by our team in the past seven years while ministering in Bulgaria has preserved the original text in its entirety and made it available to Bulgarian readers abroad. For several years now, our team has been working on a brand new project featuring unconventional technology, which combines social media and the message of the Bible. We call it simply VIDEO BIBLE – a complete video recording of the Bible text through reading, expository preaching, drama, congregational reading, visual arts and many other ways of incorporating the Bible with modern media. It is easier to use compared to the common reading and listing of text. The introduction of this unconventional media model to the social networks is much more appealing and user friendly than texting the Bible or broadcasting it as an audio stream. But even more powerful than the message itself, is its effect on the people as the church comes together in a community of faith to fulfill the Biblical commandment for reading and living the Book. This internet ecosystem is truly Bible based and everyone can see it on the recorded videos. Over 250 people, youth groups, whole churches and ministries have participated in the project until this point. Over 50% of the Biblical text has been recorded and published via our video sharing stream at http://bibliata.tv and this number is increasing daily. Every recorded and broadcasted chapter of the Bible brings new participants to the community thus exponentially increasing the effect of the project. The completion of the Bulgarian version of the Video Bible is set by the end of 2012, when our team will introduce the API for other languages and Bible versions. The idea is to create a global community of believers who introduce the message of the Bible in a user friendly video format, thus making it available to anyone who wants to read through the Bible. And something more – through its unique technology, mobile capabilities and social networking, the Video Bible is a genuine evangelism tool that could be used by anyone. The following message is a report of the Easter 2004 ministry activities of Cup & Cross Ministries International in the area of Yambol, Bulgaria. This year Easter in Bulgaria was on the same date as in the United States. Our team spent three weeks in organizing the events for the Easter week of April 4-11, 2004. The week began with special services on Palm Sunday in eight of the churches. They were followed by a three-day fast (Monday through Wednesday) along with the regular weekly program of traveling and ministry on these days. On Thursday, April 8, the congregations gathered in the Kamenetz church. A special lunch was given for the 70 children who are a part of the Sunday School program of the churches. Our team held a prayer service between 2:00 pm and 5:00 pm. At 5:00 pm everyone participated in a special ceremony of lighting newly installed neon cross on the front wall of the church. The evening service began at 6:00 pm with an Easter play and lasted over four hours. Several worship teams from the churches in Yambol (approximately 15 people) traveled to Kamenetz to help in the music program that followed. The music program turned into a spontaneous worship service where people were singing, crying and kneeling on the floor in prayer. Several of the ministers preached about Christ’s sacrifice. The sermons were followed by a Communion service in which both Protestant and Eastern Orthodox believers participated. The service ended with reciting of Psalms, testimonies, singing and payer for the sick. On Easter Sunday the congregations joined all protestant churches in Yambol. The meeting was held in the city cinema as approximately 800 were present. Bulgaria became a Christian country in 864 AD. under the reign of Kniaz Boris I. However, in the middle of the 19th century, Bulgaria was under Ottoman oppression and under the influence of the Greek Orthodox Patriarchy which dictated the religious expression of the Bulgarian church. On April 3, 1860, during Easter Sunday service in Constantinople, the Bulgarian bishop Illusion of Makariopol expressed the will of the whole Bulgarian people by solemnly proclaiming the separation of the Bulgarian church from the patriarchal in Constantinople. The day commemorating the Resurrection of Jesus Christ coincided with the resuscitation of the Bulgarian people. However, the struggle continued for another ten years when Russia forced Turkey to legally recognize the independence of the Bulgarian Orthodox Church. In 1870 a firman of the sultan decreed the establishment of an autonomous Bulgarian church institution – the Bulgarian exarchate. This year Easter in Bulgaria is the same date as Easter in the United States. Our team has been working hard for the past several weeks to organize an Easter celebration with the participation of 15 churches we provide with pastoral care. The first celebration service was on Palm Sunday in the village of Kamenetz where we have one of the strongest Pentecostal churches in the area. There were three simultaneous Palm Sunday services including Sunday school, youth rally and adult service. The people from three village churches gathered separately for the Easter preparation which will continue through Wednesday. Two lamp stands have been made for the special communion service on Thursday. They will be burning day and night until the Resurrection morning service. Protestant as well as Orthodox believers are expected to attend the Communion service. 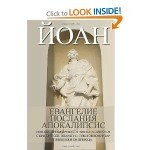 Such event of common gathering of Protestant and Orthodox congregations is unprecedented for Bulgaria. All congregations, including the Orthodox ones, are in a common fast until Easter. There will also be a special service where church members who have learned Psalms through the year will recite them for mutual edification of the congregation. Of course, there will be a testimony service as well. As we have reported, in the past several years Cup & Cross Ministries has held a variety of services in the Eastern Orthodox temples. After their unprecedented success and prayerful consideration this year we were led to hold a common service for all present churches and denominations. Please join us in prayer for a successful Easter week of ministry. What we remember from our past is what makes us continue toward the future. Our memories, even the unsuccessful ones, can make us wiser, stronger and better. Yet, we often tend to forget the bad memories; we put them away and run from them like from painful nightmares. They hurt because they usually remind us of betrayal, denial and separation. The place in Jerusalem, which is considered to be the tomb of Jesus, is a cave in the side of a hill. The dark, wooden door, which leads into it, has a sign made out of solid oak. On it with bold, black letters stand the words: “HE IS NOT HERE – FOR HE IS RISEN.” If even his grave reminds of his eternal life, how much should we remember the corner stone of our Christian faith – that He is risen, he is not among the dead any longer. He is alive forever more, and because He lives we will too live for eternity. 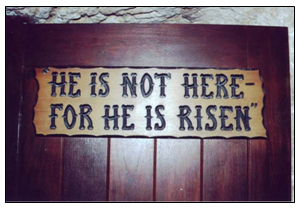 This Easter season encourage yourself and those around you with these word from the tomb of Jesus, “HE IS NOT HERE – FOR HE IS RISEN.” Happy Easter! About 11 pm on December 31, 1899 at the Bethel Healing Home in Topeka, Agnez Ozman was baptized in the Holy Spirit with the evidence of speaking in tongues after Charles Parham had prayed for her. The beginning of the year 1900 marked the genesis of the Pentecostal era. One hundred years latter we are living in a time of great need for a fresh move of the Holy Spirit. In the beginning of this New Millennium we are again the Church of the first century. Once again, we are to rediscover, reclaim and repossess the power of Pentecost, which the Early Church operated in. I am approaching this Easter season with great expectations for a mighty move of Christ’s resurrection power. I am reminded by the Word of God that this Easter, two thousand years later, He can still move stones, He can still walk through locked doors, He can still speak peace to His disciples and He can still baptize with the Holy Ghost. I am reminded that He cannot be found among the dead any longer, because Christ has risen – He has risen indeed.